ICD-10 Transition, How Much Will it Cost a Small Practice? - Outsource Management Group, LLC. 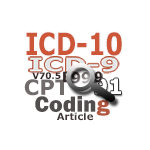 ICD-10 Coding Corner » ICD-10 Articles » ICD-10 Transition, How Much Will it Cost a Small Practice? Let’s consider a small practice (two providers, one office manager, and one coder/biller) that really “does it right” — they use cloud-based software to save on overhead and maintenance fees, follow recommendations from CMS, properly train staff, communicate with vendors, and complete successful end-to-end tests with ample time before October 1. This practice might be able to survive the transition for as little as $10K-25K. The transition to ICD-10 is not going to be a quick or simple process for providers. It’s expected to be time consuming, burdensome and costly for most providers. Like the authors, I recommend you seek out as much training, ICD-10 information and professional assistance as you need now, so you will not have a significant drop in revenue in October.